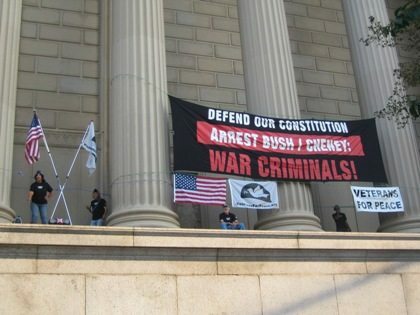 September 23, 2008: A small group of veterans are currently staging a protest and fast in Washington, DC, calling for the impeachment of President Bush and Vice-President Cheney. 5 vets climbed up on a 35-foot ledge at the National Archives building, unfurled a huge banner, and began broadcasting statements by famous Americans calling for impeachment. SEE VETS FOR PEACE WEBSITE. Here are updates thanks to OpEdNews – times are Atlantic Daylight Time. Washington — Eight hours into their occupation of the National Archives Building in Washington, D.C., Veterans For Peace members report they have called all 40 members of the House Committee on the Judiciary, urging them to actively support impeachment hearings. Way to go guys, I’m sick to death over everything going on. We are going to vote libertarian for the first time ever. We have had enough, it’s just about time for a pitch-fork party to say the least. Dan – we’re very empathetic – but every vote for a libertarian is a vote for McCain, which will hasten the worst.